In some data sets, there are values (observed data points) called outliers. Outliers are observed data points that are far from the least squares line. They have large “errors”, where the “error” or residual is the vertical distance from the line to the point. hold valuable information about the population under study and should remain included in the data. The key is to examine carefully what causes a data point to be an outlier. Besides outliers, a sample may contain one or a few points that are called influential points. Influential points are observed data points that are far from the other observed data points in the horizontal direction. These points may have a big effect on the slope of the regression line. To begin to identify an influential point, you can remove it from the data set and see if the slope of the regression line is changed significantly. We could guess at outliers by looking at a graph of the scatterplot and best fit-line. However, we would like some guideline as to how far away a point needs to be in order to be considered an outlier. As a rough rule of thumb, we can flag any point that is located further than two standard deviations above or below the best-fit line as an outlier. The standard deviation used is the standard deviation of the residuals or errors. In the third exam/final exam example, you can determine if there is an outlier or not. If there is an outlier, as an exercise, delete it and fit the remaining data to a new line. For this example, the new line ought to fit the remaining data better. This means the SSE should be smaller and the correlation coefficient ought to be closer to 1 or –1. As we did with the equation of the regression line and the correlation coefficient, we will use technology to calculate this standard deviation for us. Using the LinRegTTest with this data, scroll down through the output screens to find s = 16.412.
where ŷ = –173.5 + 4.83x is the line of best fit. Y2 and Y3 have the same slope as the line of best fit. Graph the scatterplot with the best fit line in equation Y1, then enter the two extra lines as Y2 and Y3 in the “Y=”equation editor and press ZOOM 9. You will find that the only data point that is not between lines Y2 and Y3 is the point x = 65, y = 175. On the calculator screen it is just barely outside these lines. The outlier is the student who had a grade of 65 on the third exam and 175 on the final exam; this point is further than two standard deviations away from the best-fit line. Identify the potential outlier in the scatter plot. The standard deviation of the residuals or errors is approximately 8.6. The outlier appears to be at (6, 58). The expected y value on the line for the point (6, 58) is approximately 82. Fifty-eight is 24 units from 82. Twenty-four is more than two standard deviations (2s = (2)(8.6) = 17.2 ). So 82 is more than two standard deviations from 58, which makes (6, 58) a potential outlier. In [link], the first two columns are the third-exam and final-exam data. The third column shows the predicted ŷ values calculated from the line of best fit: ŷ = –173.5 + 4.83x. The residuals, or errors, have been calculated in the fourth column of the table: observed y value−predicted y value = y − ŷ. We divide by (n – 2) because the regression model involves two estimates. Rather than calculate the value of s ourselves, we can find s using the computer or calculator. For this example, the calculator function LinRegTTest found s = 16.4 as the standard deviation of the residuals 35–1716–6–1993–1–10–9–1. We are looking for all data points for which the residual is greater than 2s = 2(16.4) = 32.8 or less than –32.8. Compare these values to the residuals in column four of the table. The only such data point is the student who had a grade of 65 on the third exam and 175 on the final exam; the residual for this student is 35. Numerically and graphically, we have identified the point (65, 175) as an outlier. We should re-examine the data for this point to see if there are any problems with the data. If there is an error, we should fix the error if possible, or delete the data. If the data is correct, we would leave it in the data set. For this problem, we will suppose that we examined the data and found that this outlier data was an error. Therefore we will continue on and delete the outlier, so that we can explore how it affects the results, as a learning experience. 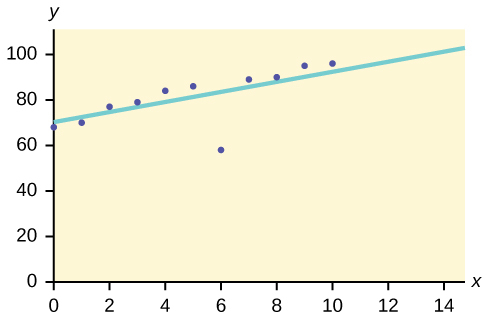 The new line with r = 0.9121 is a stronger correlation than the original (r = 0.6631) because r = 0.9121 is closer to one. This means that the new line is a better fit to the ten remaining data values. The line can better predict the final exam score given the third exam score. If you do not have the function LinRegTTest, then you can calculate the outlier in the first example by doing the following. = 2440 = SSE. The result, SSE is the Sum of Squared Errors. Next, calculate s, the standard deviation of all the y – ŷ = ε values where n = the total number of data points. For the third exam/final exam problem, . 32.94 is 2 standard deviations away from the mean of the y – ŷ values. If we were to measure the vertical distance from any data point to the corresponding point on the line of best fit and that distance is at least 2s, then we would consider the data point to be “too far” from the line of best fit. We call that point a potential outlier. For the example, if any of the |y – ŷ| values are at least 32.94, the corresponding (x, y) data point is a potential outlier. For the third exam/final exam problem, all the |y – ŷ|’s are less than 31.29 except for the first one which is 35. When outliers are deleted, the researcher should either record that data was deleted, and why, or the researcher should provide results both with and without the deleted data. If data is erroneous and the correct values are known (e.g., student one actually scored a 70 instead of a 65), then this correction can be made to the data. Using this new line of best fit (based on the remaining ten data points in the third exam/final exam example), what would a student who receives a 73 on the third exam expect to receive on the final exam? Is this the same as the prediction made using the original line? Using the new line of best fit, ŷ = –355.19 + 7.39(73) = 184.28. A student who scored 73 points on the third exam would expect to earn 184 points on the final exam. The original line predicted ŷ = –173.51 + 4.83(73) = 179.08 so the prediction using the new line with the outlier eliminated differs from the original prediction. The data points for the graph from the third exam/final exam example are as follows: (1, 5), (2, 7), (2, 6), (3, 9), (4, 12), (4, 13), (5, 18), (6, 19), (7, 12), and (7, 21). Remove the outlier and recalculate the line of best fit. Find the value of ŷ when x = 10. The Consumer Price Index (CPI) measures the average change over time in the prices paid by urban consumers for consumer goods and services. The CPI affects nearly all Americans because of the many ways it is used. One of its biggest uses is as a measure of inflation. By providing information about price changes in the Nation’s economy to government, business, and labor, the CPI helps them to make economic decisions. The President, Congress, and the Federal Reserve Board use the CPI’s trends to formulate monetary and fiscal policies. In the following table, x is the year and y is the CPI. Draw a scatterplot of the data. Calculate the least squares line. Write the equation in the form ŷ = a + bx. Draw the line on the scatterplot. What is the average CPI for the year 1990? ŷ = –3204 + 1.662x is the equation of the line of best fit. The number of data points is n = 14. Use the 95% Critical Values of the Sample Correlation Coefficient table at the end of Chapter 12. n – 2 = 12. The corresponding critical value is 0.532. Since 0.8694 > 0.532, r is significant. In the example, notice the pattern of the points compared to the line. 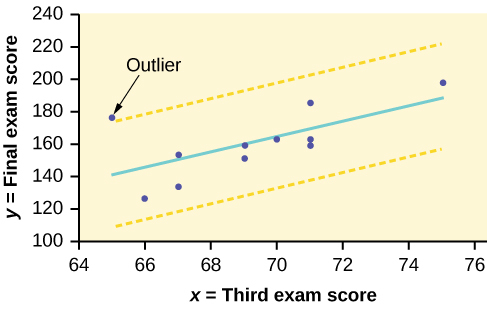 Although the correlation coefficient is significant, the pattern in the scatterplot indicates that a curve would be a more appropriate model to use than a line. In this example, a statistician should prefer to use other methods to fit a curve to this data, rather than model the data with the line we found. In addition to doing the calculations, it is always important to look at the scatterplot when deciding whether a linear model is appropriate. The following table shows economic development measured in per capita income PCINC. Use regression to find the line of best fit and the correlation coefficient. Interpret the significance of the correlation coefficient. Is there a linear relationship between the variables? Find the coefficient of determination and interpret it. What is the slope of the regression equation? What does it mean? Use the line of best fit to estimate PCINC for 1900, for 2000. Determine if there are any outliers. a. The independent variable (x) is the year and the dependent variable (y) is the per capita income. d. At df = 8, the critical value is 0.632. The r value is significant because it is greater than the critical value. e. There does appear to be a linear relationship between the variables. f. The coefficient of determination is 0.947, which means that 94.7% of the variation in PCINC is explained by the variation in the years. 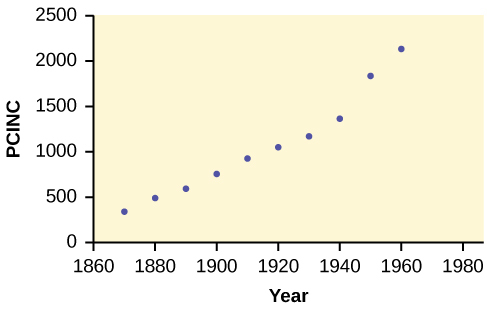 g. and h. The slope of the regression equation is 18.61, and it means that per capita income increases by 18.61 for each passing year. ŷ = 785 when the year is 1900, and ŷ = 2,646 when the year is 2000.
i. There do not appear to be any outliers. Data from the House Ways and Means Committee, the Health and Human Services Department. Data from the United States Department of Labor, the Bureau of Labor Statistics. Data from the Physician’s Handbook, 1990. If any point is above y2or below y3 then the point is considered to be an outlier. Use the residuals and compare their absolute values to 2s where s is the standard deviation of the residuals. If the absolute value of any residual is greater than or equal to 2s, then the corresponding point is an outlier. Note: The calculator function LinRegTTest (STATS TESTS LinRegTTest) calculates s.
Yes, there appears to be an outlier at (6, 58). A point is removed, and the line of best fit is recalculated. The new correlation coefficient is 0.98. Does the point appear to have been an outlier? Why? 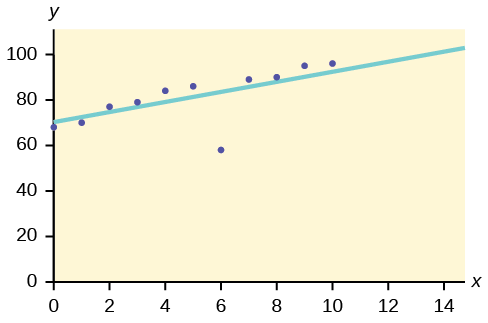 The potential outlier flattened the slope of the line of best fit because it was below the data set. It made the line of best fit less accurate is a predictor for the data. The Sum of Squared Errors for a data set of 18 numbers is 49. What is the standard deviation? The Standard Deviation for the Sum of Squared Errors for a data set is 9.8. What is the cutoff for the vertical distance that a point can be from the line of best fit to be considered an outlier? Based on the data in [link], is there a linear relationship between the number of stories in tall buildings and the height of the buildings? Ornithologists, scientists who study birds, tag sparrow hawks in 13 different colonies to study their population. They gather data for the percent of new sparrow hawks in each colony and the percent of those that have returned from migration. a. and b. Check student’s solution. c. The slope of the regression line is -0.3179 with a y-intercept of 32.966. In context, the y-intercept indicates that when there are no returning sparrow hawks, there will be almost 31% new sparrow hawks, which doesn’t make sense since if there are no returning birds, then the new percentage would have to be 100% (this is an example of why we do not extrapolate). The slope tells us that for each percentage increase in returning birds, the percentage of new birds in the colony decreases by 0.3179%. d. If we examine r2, we see that only 50.238% of the variation in the percent of new birds is explained by the model and the correlation coefficient, r = 0.71 only indicates a somewhat strong correlation between returning and new percentages. e. The ordered pair (66, 6) generates the largest residual of 6.0. This means that when the observed return percentage is 66%, our observed new percentage, 6%, is almost 6% less than the predicted new value of 11.98%. If we remove this data pair, we see only an adjusted slope of -0.2723 and an adjusted intercept of 30.606. In other words, even though this data generates the largest residual, it is not an outlier, nor is the data pair an influential point. f. If there are 70% returning birds, we would expect to see y = -0.2723(70) + 30.606 = 0.115 or 11.5% new birds in the colony. The following table shows data on average per capita wine consumption and heart disease rate in a random sample of 10 countries. We have a slope of –1.4946 with a y-intercept of 193.88. The slope, in context, indicates that for each additional minute added to the swim time, the heart rate will decrease by 1.5 beats per minute. If the student is not swimming at all, the y-intercept indicates that his heart rate will be 193.88 beats per minute. While the slope has meaning (the longer it takes to swim 2,000 meters, the less effort the heart puts out), the y-intercept does not make sense. If the athlete is not swimming (resting), then his heart rate should be very low. Since only 1.5% of the heart rate variation is explained by this regression equation, we must conclude that this association is not explained with a linear relationship. The point (34.72, 124) generates the largest residual of –11.82. This means that our observed heart rate is almost 12 beats less than our predicted rate of 136 beats per minute. When this point is removed, the slope becomes 1.6914 with the y-intercept changing to 83.694. While the linear association is still very weak, we see that the removed data pair can be considered an influential point in the sense that the y-intercept becomes more meaningful. A researcher is investigating whether non-white minorities commit a disproportionate number of homicides. He uses demographic data from Detroit, MI to compare homicide rates and the number of the population that are white males. Using the data to determine the linear-regression line equation with the outliers removed. Is there a linear correlation for the data set with outliers removed? Justify your answer. If we remove the two service academies (the tuition is 0.00), we construct a new regression equation of y = –0.0009x + 160 with a correlation coefficient of 0.71397 and a coefficient of determination of 0.50976. This allows us to say there is a fairly strong linear association between tuition costs and salaries if the service academies are removed from the data set. The average number of people in a family that received welfare for various years is given in [link]. Based on the data in [link], is there a linear relationship between the year and the average number of people in a welfare family? The percent of female wage and salary workers who are paid hourly rates is given in [link] for the years 1979 to 1992. As the year increases by one, the percent of workers paid hourly rates tends to increase by 0.1656. Use the following information to answer the next two exercises. The cost of a leading liquid laundry detergent in different sizes is given in [link]. Complete [link] for the cost per ounce of the different sizes. There is a linear relationship for the sizes 16 through 64, but that linear trend does not continue to the 200-oz size. The relationship is not linear; the least squares line is not appropriate. No, you would be extrapolating. The 300-oz size is outside the range of x.
slope = –0.08194; for each additional ounce in size, the cost per ounce decreases by 0.082 cents. Find the estimated total cost for a next taxable estate of 1,000,000. Find the cost for 2,500,000. The following are advertised sale prices of color televisions at Anderson’s. Size is x, the independent variable, price is y, the dependent variable. The relationship does not appear to be linear. No, the relationship does not appear to be linear. However, r is significant. [link] shows the average heights for American boy s in 1990. Let rank be the independent variable and area be the dependent variable. There appears to be a linear relationship, with one outlier. r = 0.50047, r is not significant so there is no relationship between the variables. Alabama estimate is closer than Colorado estimate. If the outlier is removed, there is a linear relationship. There is one outlier (Hawaii). Alabama: 85,162.404; the prior estimate was closer. Alaska is an outlier. Outliers by OpenStaxCollege is licensed under a Creative Commons Attribution 4.0 International License, except where otherwise noted.